The NFL is a league of parity in which the margin between winning and losing is razor thin. On a regular basis, underdogs take it to the favorites, and we’re all but guaranteed to see that happen once again in NFL Week 3. Last weekend, the Houston Texans were shocked by the Tennessee Titans, and the Kansas City Chiefs put the league on notice with a barnburner of a win over the Pittsburgh Steelers. Which favorites are on upset alert this weekend? We’ve got some ideas. The Texans are in danger of falling to 0-3 against the Giants, who come into the game as road dogs by more than a field goal. Houston’s offensive line has been a miserable wreck so far, and has gotten the elusive Deshaun Watson sacked seven times in two games. Granted, the Giants have been awful at bringing pressure their first two games, so this is going to be an interesting battle to watch. The key to New York pulling off the upset here is getting Saquon Barkley going early. The rookie running back has the ability to take a game over, but so far the Giants have made Eli Manning and the passing game the focal point. If they change up the focus, they’ll have a shot to win their first game this season. 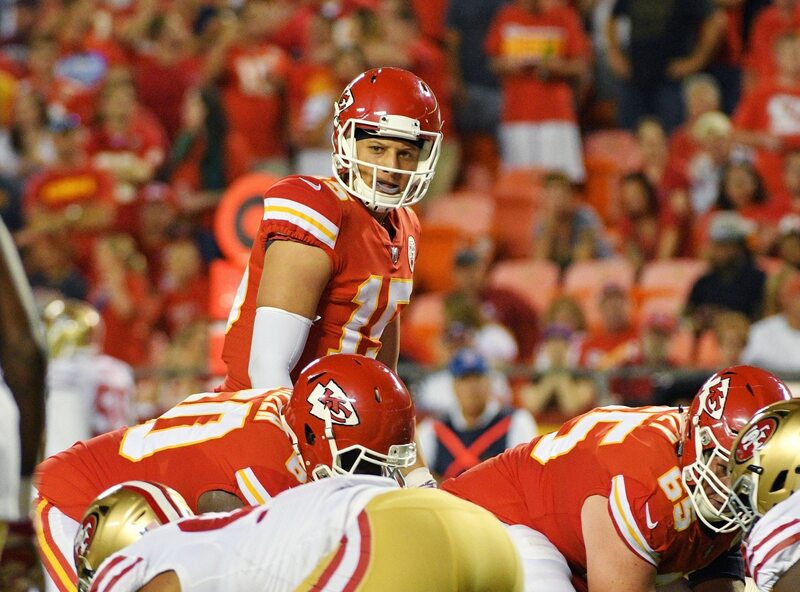 Picking the Chiefs to lose is based on two factors. First, we have to assume that there’s no possible way Patrick Mahomes can stay this hot forever. He’s been the best quarterback through two games in the Super Bowl era, but he just has to cool down at some point. Perhaps San Francisco’s dominant defensive line will finally force him to make a few mistakes that could tilt the game in the 49ers’ favor. The second factor is that Kansas City’s defense is just awful. We’ve seen it through two games, and the Chiefs have gotten away with it because the offense has been unstoppable. But if Jimmy Garoppolo and Co. can minimize their own mistakes and put points on the board against this weak unit, the 49ers can definitely win. Carson Wentz is back, which is really exciting for Eagles fans. Heck, it’s exciting for NFL fans in general. He’s one of the most talented young quarterbacks in the league, and the Eagles are a lot more fun when he’s on his game. That said, nobody should expect him to be razor sharp in his first action since exiting with a torn ACL last year. On top of that, Philly’s roster is just decimated by other injuries, including at the running back spot. So, the Eagles will be shorthanded here when they take on the Colts. Speaking of the Colts, their defense was shockingly good last weekend on the road against Washington. They limited big plays and didn’t allow a touchdown. While we don’t expect that trend to continue in Week 3, the Colts do have a chance to win if they can keep Philly’s receivers in front of them and play tough on third downs. Cincinnati’s defensive front is devastating. Geno Atkins already has three sacks in two games. Carlos Dunlap is as dangerous as ever. Rookie Sam Hubbard has made an early impact, and Carl Lawson is a demon off the edge. On the other side, Carolina’s offensive line is more often than not a train wreck. All that to say, Cam Newton could be in for a rough afternoon against the Bengals. On the flip side, Andy Dalton has been remarkably efficient the past 16 games, throwing more touchdown passes than every quarterback in the league except Tom Brady and Russell Wilson. Don’t be surprised if the Bengals pull off the road win here to move to 3-0 on the season. Rushing yards are going to be tough to come by when these two Los Angeles teams clash. Heck, explosive offensive plays in general will be, too. Both teams feature defenses that can shut down the run and bring pressure in the passing game. This means it’s going to come down to quarterback play under pressure. And while it’s true that Jared Goff has come a long way since his disastrous rookie season, we still trust Philip Rivers to come through more than his third-year counterpart in this game. That the Seahawks are favorites to win this game is something I just don’t get. Seattle’s defense isn’t good. We fully expect Ezekiel Elliott to have a huge game against a defense that ranks No. 23 in the league. The Seahawks also are struggling to bring consistent pressure against the pass, which bodes well for Dak Prescott. But the biggest reason to think the Cowboys will upset the Seahawks is that Seattle’s offensive line is a disaster. Russell Wilson has already been sacked 12 times, and the Cowboys have been very good about bringing the heat. Look for DeMarcus Lawrence, Taco Charlton and Co. to feast.